Bali Surfing Reasonable surf lesson package! In this course, You can try surf school plus 4 kind of marine sports! You can choose from 2.5 hours surf schoo until 4 hours long course! The location at Serangan where white sand beach and clear water ocean. 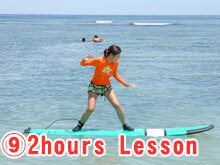 Waves are easy for beginner so you will have fun first surf lesson! 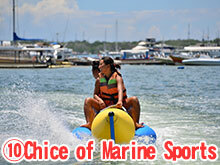 Not only surfing, you can also try marine sports! In this course, not only surf that you can try, you can also try Banana Boat, Parasailing and Fly fis! Marine sports held at Serangan island where beautiful white sand beach. There is only one marine sports company so you can avoid crowded. Easy access from Ubud, Sanur area. 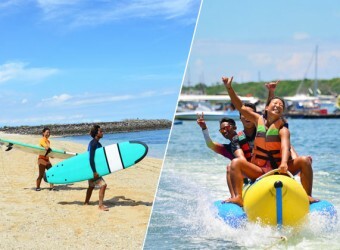 Seranga surf school located in Seranga Island where easy access from Sanur. It is also easy to access to Ubud. so you can stop by safari park or after another activity. Serangan island is till development area so there are lots of nature and less people beach. These schedule is sample. time will change by sea tide. Pick up time also change by sea tide. ・There is additional fee depending on hotel area. ・You can choose from 4 course, please let us know which course you want. Not for anyone who expect rich service. Even though we consider “Not Only Reasonable Prices but also some great deals”, our No.1 priority in this courses is the price, so staff service, skills/techniques and facilities will not satisfy some of the guests. Therefore, we do not recommend these courses for anyone who expects the greatest service. We do not take the responsibility for your claims and troubles. If our partner company and you had a trouble, we are here for you to help translating and provide your opinions to the company to make the service better. However, we are not responsible for the trouble. 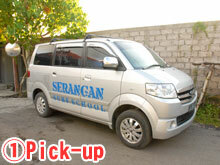 ※Transport can drop off at Kuta, Sanur, Seminyak area. US＄ is proffered, but Rp. and JPN￥ is also available. The rate is converted by the agency. All the change is in Rp. The rate is converted by the agency. 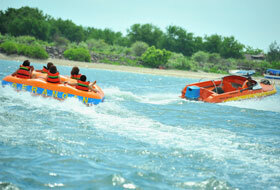 ※All the Marine Sports are available regarding of the tide. It includes a choice of free lunch (Mie Goreng, Nasi Goreng and Sandwitches). The maximum Rp.250,000,000 insurance is applied for medical treatment, accident and death. The weight limit of Parasailing is 90kg and Fly fish is 75kg. Please, book with over 2 people. Please, write names of the marine sports and the spa courses you want from the contacting form below.